Hi foodies, Welcome to AYESHA'S KITCHEN. 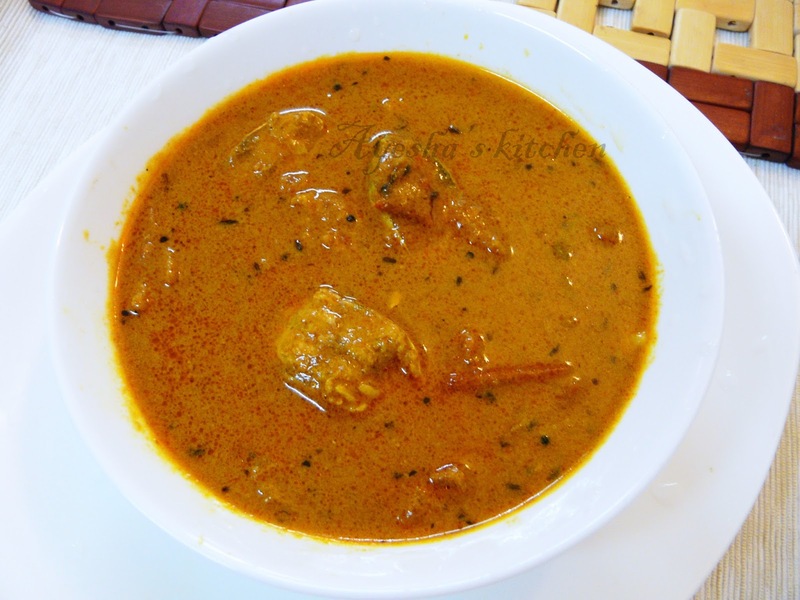 Today's recipe is one of the special Indian fish recipes - Goan fish curry. Goa is a state in India which attracts tourists. The resorts in goa / Goa hotels with their delicious, mouth watering food persuade tourists, again and again, to explore Goa as a tourist destination. Goan fish curry recipe is the traditional Goan dish and the fish curry with rice which is yellowish red in color is known as xittcoddi in konkini. Goan food recipes are considered incomplete without fish and hence their cuisine is based on seafood. I love searching for new tastes and new ways of cooking. So I always chit chat with my neighbors and my relatives regarding their best recipes. And such tried, tested collections are some of my most popular dishes in this blog. Yesterday, one of my neighbors inquired me about my blogging and she asked me to add some Goan curry dishes too. She is from Goa and so she compelled me to try their fish curry recipe and said, "this will surely become a great hit in your blog". But until then I believed that the tastiest fish curry recipes are Kerala fish curry, Malabar fish curry, Kottayam fish curry and so on. But once I tried this Goan fish curry, I could say that this is one of the tastiest fish curry ever...!! !Truely...it was very very tasty...Thanks a ton to my sweet sister and neighbor Mareena George for this very special Goan recipe. 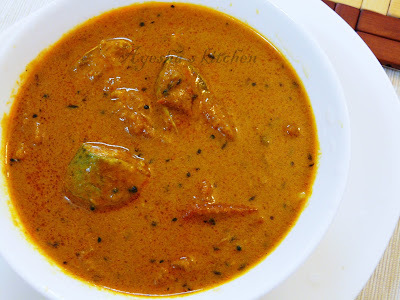 Guys, please try this simple curry fish recipe, for sure you all will crave for more....Please share your valuable feedback about this special yummy curry. Marinate the cleaned and sliced fish with the above spices. After 10 minutes, shallow fry it till half done and set aside. Meanwhile, Heat oil in a clay pot or in a nonstick vessel. When hot, splutter mustard seeds and cumin seeds. Then add the ginger garlic paste and saute till the raw smell goes off. Now add tomato chopped and cook with lid closed until oil separates. When done, add chilly powder, turmeric powder, fenugreek powder, coriander powder, and salt. Mix very well. Let it cook well until it reaches a thick gravy consistency. Add half a cup of water to it and brings to boil. Now add the half done fish. Mix with care and let it cook for 2 minutes and then add coconut milk. Mix gently or rotate the vessel. Bring to boil again and cook for few minutes. Finally, add some lemon juice and remove from flame.